Week one of 2011 was a good one. On the home front, Scott and I both got more hours and more $$ in our jobs for the new year. My health situation is improving daily (more about that in the next post) and the time off from school has been nice. I figured out this week that I have enough hours to apply for my MAR (Master of Arts in Religion) and I can incorporate the hours for that degree into the MDiv, which is great. Crafting has taken a slight turn for me this new year also. The scare I had in November really made me think about what I have done in my life and what I have put off. Many years ago I used to enjoy shuttle tatting. A couple of years ago I bought a book that came with a DVD on how to do this craft. My idea was that I would go through the book, watch the DVD and “re-learn” how to do it again. Every time I came across that book on the shelf I thought “someday I will have to do that.” Well, the past two weeks have been someday! The book and the DVD were excellent, with one exception: the written patterns don’t match the line drawings, or the photos. All three are correct, however, the written pattern may contain an extra picot, where the picot is not shown in the photo of the finished piece, etc. The DVD was well worth the price of the book though. Here is what I have accomplished this week. This is my first attempt at a bookmark. My picots, along with everything else, need a little work, but it turned out ok for a first try. 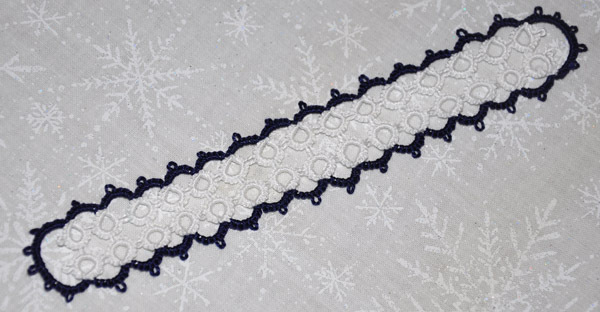 This is “Tatted Motif #12” from Free Tatting Patterns. This shows some improvement in my technique, however, I need to make my picots larger. 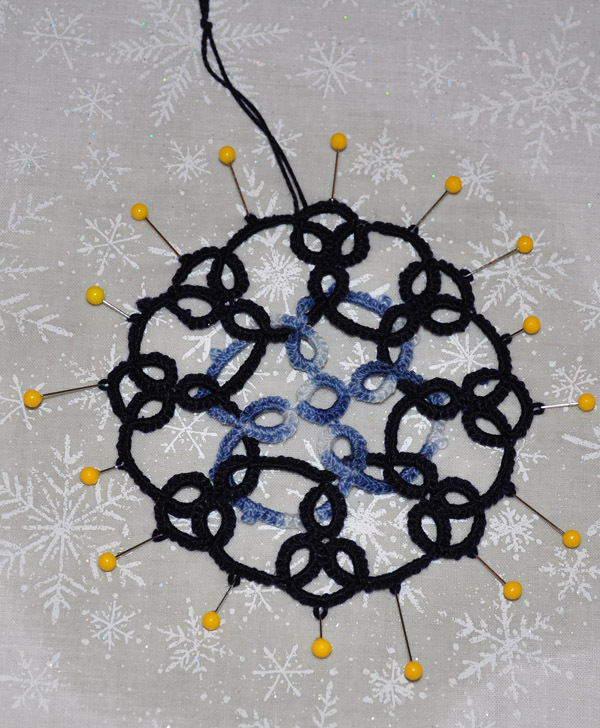 This one will be part of a collection of snowflake motifs that adorn our Christmas tree at the end of 2011. To better pursue this goal, I have added to my collection “Tatted Snowflakes Collection” by Jon Yusoff and “Tatted Flurries” by Sharon Briggs. Those will do nicely for starters.